Cell synchronization is the very first step when UE wants to camp on any cell. From this, UE acquires physical cell id (PCI), time slot and frame synchronization, which will enable UE to read system information blocks from a particular network. synchronization signal (PSS) which is located in the last OFDM symbol of first time slot of the first subframe (subframe 0) of radio frame as shown in figure (green squares). This enables UE to be synchronized on subframe level. The PSS is repeated in subframe 5 which means UE is synchronized on 5ms basis since each subframe is 1ms. From PSS, UE is also able to obtain physical layer identity (0 to 2). In the next step UE finds the secondary synchronization signal (SSS). SSS symbols are also located in the same subframe of PSS but in the symbol before PSS as shown in the figure(yellow squares). From SSS, UE is able to obtain physical layer cell identity group number (0 to 167). Once UE knows the PCI for a given cell, it also knows the location of cell Reference signals as shown in figure (red and black squares). 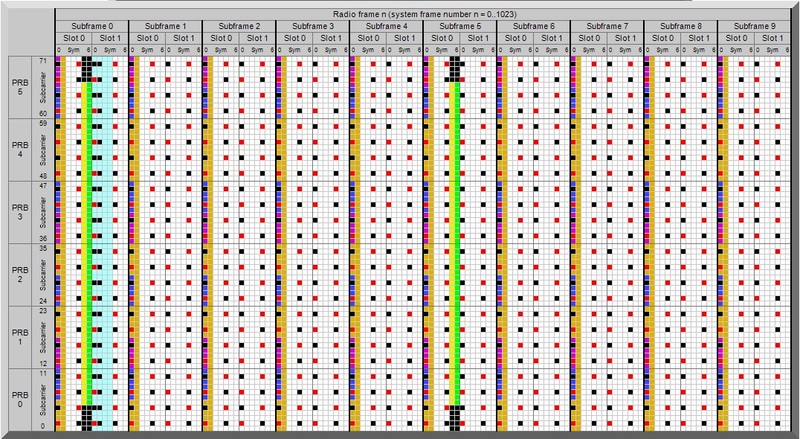 Reference signals are used in channel estimation, cell selection / reselection and handover procedures. Excellent job here. Thanks very much. I finally have come to understand this complex procedure intuitively. "From PSS, UE is able to obtain physical layer cell identity group number (0 to 167)." I think you mean "From SSS". Hi thanks for pointing out this mistake. Can you please explain on which channel PSS & SSS transmitted??? PSS and SSS are signals transmitted in PDSCH. I don't understand how can we know from the PCI the RS location? ok!!! Thank you very much! we get it! I am using VSA for a LTE signal demodulation. knowing the PCI,I have already set the RS frequency shift, but still the demodulation is not correct. Is there any other parameters to set apart from the center frequency, the bandwith and the RS location...? I wonder how the UE keep the synchronization after achieving initial synchronization. I mean, whether it constantly monitor the PSS and SSS or it keep synchronization in another way. What is the difference in IDLE and CONNECTED mode in this regard? Do you know the 3GPP reference, where it is described? Сan be packaged in one RB for the user data and signaling information? Hi.. Yes user data (DRB)and signalling information (SRB) can be sent in one resource block ..
Its mentioned here that PSS is repeated in sub-frame 5. But, I have read that PSS is sent in sub-frame 0 and sub-frame 9.
primary synchronization signal is transmitted twice per radio frame, so it is repeated in subframe 5 to provide 5m synchronization.. what is your source of information ? In other words for 84 PCIs there is one fixed location (84*6=504). Does this 84 number is derived from 12 (sub carriers) * 7 Symbols = 84 [Resource grid] from 1.4 Mhz BW ? or is this Resource grid block [12 *7] is constant for all BW's in LTE ? Thanks for the amazing blog. I need a detailed description (on bit or byte level) of SIB1. Please give me some direct reference. i have a query about the part just below and above pss/sss which is in black. 1) it says it is unused by a specific antenna port or undefined for all antenna port , what does this mean exaclty?? 2) also if one were to map PRS (positioning reference signal), will it be mapped in this black spots ??? i mean it is exactly not pss/sss, and in specs it says that PRS will not be mapped to the resource elements reserved for PSS/SSS and PBCH??? I have a question about PCI planning. Is it technically possible to assign different SSS for the cells on the same enodeb (at same earfcn)...? Thus the PCIs will be non-consecutive..! might be this is a very silly question can you please explain how UE will know that this is the bandwidth where i will look for PSS and SSS , since till that point MIB has not been broadcast. And also which one is 0 and 10th slot, 7th symbol as there is no information of all those things. Since SSS uses only one OFDM symbol(#5 in # 0Subframe & #5 in #5 Subframe) using QPSK. So, it can only represent a 2bit information. But there could be 168 possible Pseudo Random sequences of SSS. Then how UE gets the information of one of the 168 possible combinations of SSS? How does UE know to such slot and symbol it has to camp on to perform synchronization, thx! Why PSS is positioned after SSS if PSS needs to be decoded first? UE get frequency from PSS, yes or no and How? UE get frequency from PSS yes or no and How? No UE must retune and step at 100 KHz until it gets a correlation hit with the PSS, (or goes to last known freq.... typical 3pp UE behavior). PSS & SSS are transmitted through which channel??? This is great information about Primary and secondary synchronization signals. I really love it. Thanks for Sharing with us. Complexity has been simplified in this article ...Thank You very much. Could be a basic question. How could the PSS and SSS could be indentified without knowing the bandwidth information. As MIB is decoded after frame synchronization and cell identification? Could you please let me know the way to calculate the Sync Signals (PSS&SSS) Power for a 40W, LTE 2100 MHz Network.